KGAL design safe, reliable, efficient low voltage power distribution and control systems; from conceptual designs to preliminary and detailed specifications where these are associated with our core markets: moving structures, water control and renewable energy: tidal and hydropower. The power and control systems range from critical facilities requiring an uninterrupted power supply (UPS) and generator back-up to standard automatic systems with manual operating needs. 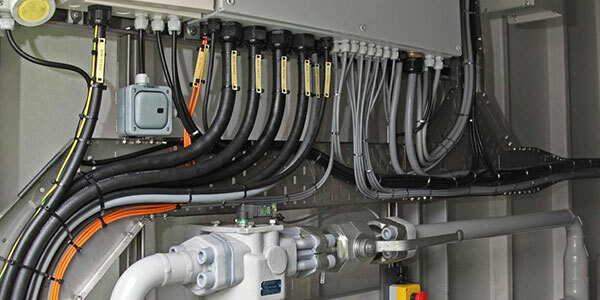 Where process conditions require adjustment of flow from a pump, such as bridge slewing mechanisms, varying the speed of the drive using variable-speed drive (VSD) equipment to control the speed of machinery may save energy compared with other techniques for flow control. Programmable Logic Systems (PLC) represent key aspects of our electrical system designs. • Compiling technical file for CE marking. We also have vast experience of designing and managing the installation of HV systems and equipment; everything from switch gear (e.g. SF6 and vacuum circuit breakers, protection relays) to very high MVA rated transformers and high specification hydro-generators. KGAL also undertakes factory acceptance testing, site tests and commissioning. 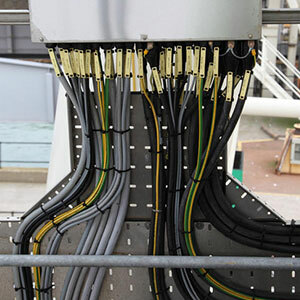 The images show electrical and hydraulic circuits / systems controlling the Ro-Ro linkspan, Berth 6, at the Port of Dover, England.